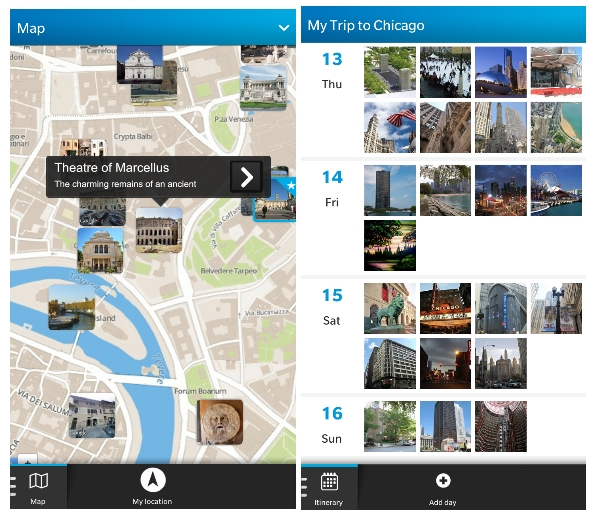 Tripomatic launches travel planning app for BlackBerry 10 | BlackBerry Blast! Travel planner Tripomatic has released a native app for BlackBerry 10 that enables travelers to create personalized travel itineraries and navigate around their destination. Travelers can download their itinerary to the app, plan their trips directly from their phones, or can use the app to discover interesting places around them. is available as a free download in the BlackBerry World. �Since we launched our first mobile apps, we had numerous requests to make Tripomatic available on BlackBerry. Being a big fan of the BlackBerry Z10 smartphone myself, I am very excited that we have created a native travel planning app where everything works exactly as you would expect on a BlackBerry 10 phone.� said Lukas Nevosad, Tripomatic CEO.